The TAG Heuer Monaco range of automatic chronograph wristwatches was originally introduced in 1969 in honour of the Monaco Grand Prix. TAG Heuer Monaco watches rose quickly in popularity after being worn by Steve McQueen – known as the original “King of Cool” – in the 1970 film ‘Le Mans’. McQueen wore that first Monaco watch within a year of its creation, so the appeal of the timepiece was instant, and it has since become an iconic chronograph that’s beloved by multitudes of enthusiasts. With an instantly recognisable blue face to match the striking blue eyes of the man who it became synonymous with, the Calibre 11 and Calibre 12 are perhaps the TAG Heuer Monaco watches that possess the most widespread renown, although there’s plenty to celebrate within the range as a whole. Even some five decades after the launch of the original Monaco timepiece, the range is still pushing boundaries with designs like the revolutionary Monaco V4, which was the very first watch to depend on belt-driven transmission. Design wise, the classic Monaco was the world’s first square automatic chronograph, with the original blue design made even more distinctive by the counters at 3 and 9 o’clock, red-orange hands and blue alligator strap. As well as being a timeless classic, it is also a very desirable everyday watch that’s suitable for those who are looking for a specialist sports chronograph. 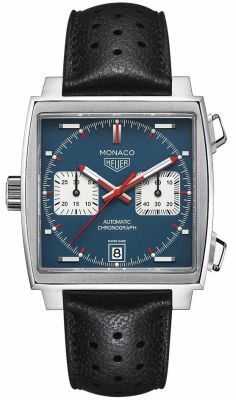 Within the series of TAG Heuer Monaco watches, there is a wide range of aesthetic options, giving different strap, case and dial variants, and the fact that the Monaco has been reissued and reintroduced a number of times throughout TAG Heuer’s history means that there are models aplenty. From the limited edition TAG Heuer Monaco Steve McQueen Calibre 11 Chronograph, to the more understated TAG Heuer Monaco Calibre 12 watch, and even a special Monaco inspired by the Kingsman films and modelled by Halle Berry, there are designs to suit all tastes and occasions. As we are authorised stockists of TAG Heuer Monaco watches here at Banks Lyon Jewellers, you can be safe in the knowledge that the items in stock are genuine TAG Heuer watches. What's more, we also offer TAG Heuer timepieces on 0% finance, letting you make a purchase over a period of as long as 48 months, and take advantage of a 10% deposit amount. Feel free to get in touch with us on 01524 384 858 or email us at personalshopper@bankslyon.co.uk to check product availability and information.